STANDARD: A 1500m swim followed by 10km run. For those looking for a real tough challenge. We have also added a relay entry for each distance - in teams of two, one person swims and the other runs. Congratulations to all finishers, final results from the first race of the season can be seen here. There are some nice pics on our Facebook page. With four days to go we have now published the provisional wave times and start list which can be seen here. Now is a nice time to mention our race partners SportPursuit. Their support in making this event happen has been significant - make sure you pop along to their tent on race day to pick up your race certificate, get your photo taken and meet the team! Please note, at current wetsuits are not compulsory but are highly recommended, especially for anyone other than the gnarliest of veterans to open water swimming. If there is a dip in temperatures we will review the situation at the weekend, so please prepare for the worst! So it's six days until the SportPursuit Splash series begins, starting with the SportPursuit Splash this Sunday (you can still enter here). With all this looking forward, now is a nice time to think about the finish line. 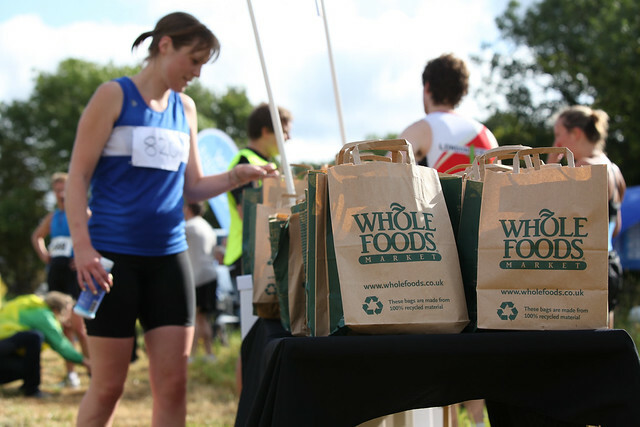 The lovely Whole Foods Market in Stoke Newington will be providing goodie bags for all finishers in the race. To prepare for your first race of the summer, why not try one of these recipes? Finally the long winter is behind us and we can get splashing in the West Reservoir! Capital Tri can therefore announce the first set of weekly coached open water swim sessions to help you improve your fitness and technique in triathlon and open water swimming. Advanced swimmers will benefit from our fitness sessions while intermediate and beginner swimmers will be more at home with out open water technique sessions. FOUR WEEK NOVICE COURSE - Just £20 for four one hour sessions, start the course full of nerves and finish ready to race! 10 WEEK INTERMEDIATE/ADVANCED PASS - 10 coached one hour fitness sessions at West Reservoir for just £75. A saving of £25 over the duration of the course. Both courses start on 26th May. We will also be taking weekly payments for those who cannot commit to a longer block. Details to follow.